Oh...hey! I’m here. I mean...it’s me! You know...Katie’s long-lost Texas BFF, Stephanie from like, 3624 blog years ago. I’ve also been known to be crazy enough to plan a girl’s trip to Orlando, Florida for 30 grown women to spend four days in Disney...without kids. Yes...no kids at Disney World. And guess what?! Katie is one of them! That’s right...tomorrow Katie will be flying down from the O-H to meet me down in Orlando to spend 4 glorious days at the International Food & Wine Festival hosted at Disney’s Epcot theme park each and every year. 30 women + wine + Disney...I mean, what could possibly go wrong. 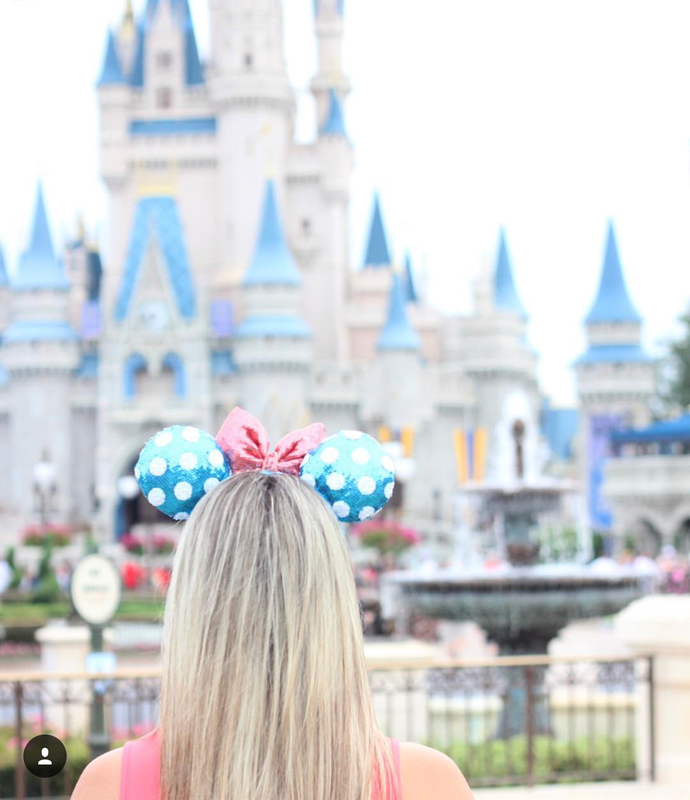 With our Disney World vacation right around the corner, Katie asked me to step in and put together a post to include everything you could ever possibly need for your Disney World or Disneyland vacation. While this list could go on for days because …. #kids and the fact that they need #allthethings, I wanted to touch on some of the most important key items to include in your suitcase before you pack up and head to the castle. Because Disney World is located in Orlando, Florida, and has somewhat of a tropical climate, it is very important that you pack the proper attire for each and every day you’ll be there. Similar to Disney World, Disneyland requires proper packing as well. While it is warm in Disney World and Disneyland 7-9 months out of the year, the key to a stress-free vacation is a properly packed suitcase for your and your family. Additionally, because Disney has a very advanced technological vacation system, there are many items you want to be sure to include when it comes to packing your suitcase. Comfortable theme park clothes: I love me a good pair of denim shorts and a razorback tank for those HOT days in the parks. For the winter months, a cute pair of leggings and a lightweight sweater are perfect! Comfy flip flops: I find many times my feetsies need a change of scenery. I always pack my Sanuks with me to change into in the early evening to allow my feet to breathe. Swimsuits: Disney heats the pools year-round. If you are traveling between the months of February-November, you can plan on dipping in a pool at some point during your vacation. Mickey/Minnie ears: You WILL feel out of place without them. Comfortable/breathable clothes and shoes. The last thing you want is an uncomfy kiddo in clothes that are hot, scratchy or uncomfortable and sandals that kill their little feet. Princess attire: Trust me...you do NOT want to buy it there. Pre-loaded Disney gift cards: We ask for these for every birthday and holiday and save them for our vacations to use on souvenirs. Additionally, you can use Disney gift cards to pay for your hotel reservation as well! Magic Bands (for Disney World only): Your MagicBand serves as your hotel room key, park ticket, form of payment, ride entry and SO much more! I swear these things are magical! Phone chargers: Your entire Disney vacation is run through the My Disney Experience smartphone app. All of your dining reservations, all of your FastPass attractions, all of your dining credits and park maps...they all live within an app on your smartphone. Pair that with paparazzi-style mom photography and videos being taken throughout the day and you’re bound to end up with a dead phone by 10am. Not exaggerating. Pack portable phone chargers with you at all times, and pack multiple! For extensive packing lists, you can download my Walt Disney World Packing List here and download my Disneyland Packing List here. Now for those of you going on a Disney cruise, your packing list is going to look fairly different. For my full Disney Cruise Line packing list, click here! And if all of this felt like you were drinking out of a fire hydrant, that’s what I’m here for! Traveling Ears Vacations is my Disney-focused travel agency where I specialize in all things Disney vacations. And the best part - it’s 100% free to you! That’s right...because we are authorized and contracted through Disney, Disney takes care of us financially so that you don’t have to. So whether it’s your first, fifth or fiftieth Disney vacation, I would love to show you how we can personalize a vacation that’s as special and unique as your family is. Feel free to check out our services here, request your quote here or follow us on Instagram to see what we’ve been up to! I’d love to hear from you or answer any questions you have! In the meantime, be sure to follow our girl’s weekend at the happiest place on Earth by following mine and Katie’s Instagram stories!